Breeda was born and raised in Dublin, starting out her adult life working as a nurse and engaged to a man called Seamus. Seamus was killed by a brain hemorrhage, very tragically and suddenly, when Breeda was just 24. She was heartbroken. 10 years later, Breeda tells us, she was still struggling to deal with the grief. Soon afterwards, Breeda packed in her career as a nurse and began working as a social worker in Cork. At the time, she still identified outwardly as straight – though was moving slowly towards coming out. She’d always had a feeling she was gay; in the 1970s, she’d seen herself as having at least tried a lesbian relationship by the age of 40. 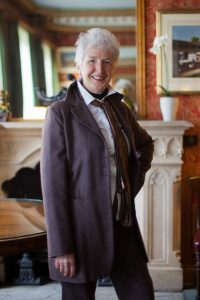 On studying a Master’s degree in Women’s Studies at Cork University to allow herself to think about her sexuality and identity on an intellectual and theoretical level, Breeda became immersed in Cork’s LGBTQ scene and began feeling a definite attraction towards women. After graduating from Cork University Breeda moved to New York City, where she became involved with the Irish Lesbian & Gay Organisation. It was in the Big Apple that she was visited by Priscilla, a woman she’d met through a mutual friend on a women’s holiday in Donegal a few years prior. Priscilla’s stay coincided with New York’s Dyke March and Pride season. Before long, the pair had fallen in love.